When I go shopping, the first thing I do is go to the clearance aisles for all departments! 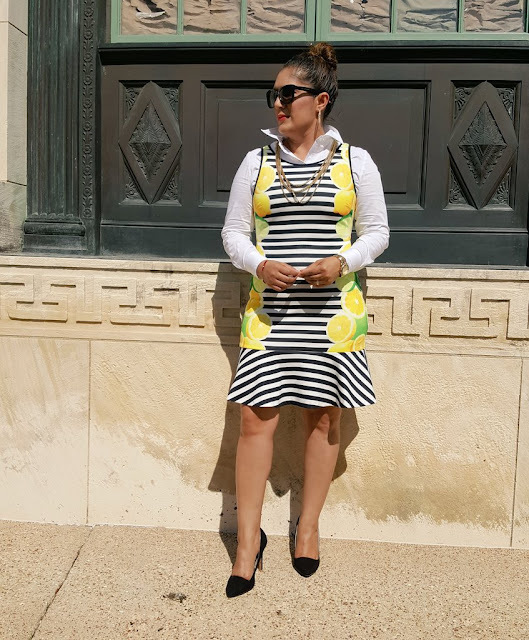 This Elle striped dress with lemons and limes was regular $40 and I paid $8!!!!! Now that is a deal!You can wear it Spring or Fall! Here I paired it with a white collar button up and black pumps! I'm love shopping clearance sales! Especially when you find clothes that you can wear season in season out!I'm found this Marilyn Monroe one piece jumpsuit for just $8.99! So of course, I'm had to buy the red one!I'm paired this black jumpsuit with a white belt and white pumps!